When you are pregnant, the hormones in your body are having a field day. Your usual hormones disappeared and were replaced by new hormones that will only stick around for the duration of your gestation. This change usually has a number of effects on the maternal body, both physically and mentally. 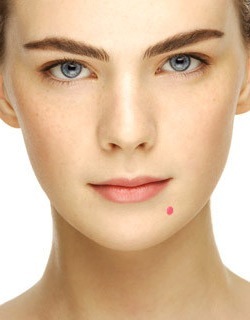 Since acne and pimples are so directly associated with hormones, you might notice a change in your complexion. Many women who have had acne their whole lives notice that it clears up when they become pregnant because the estrogen tends to calm the androgen hormones, which cause acne. However, some women notice that they get more acne during their pregnancy, and some get it for the very first time. When pregnant women get acne for the first time, it usually only lasts the duration of the pregnancy, but scarring could be a problem. If you’re looking to treat your acne during you pregnancy, you should be aware of which remedies are safe for your developing baby. For acne that is under the surface, such as blackheads, research shows that the use of benzoyl peroxide is safe. However, Azelaic acid is not recommended. In general, topical creams, lotions and treatments are not recommended because studies suggest that the chemicals might go through the system and reach the fetus. Oral antibiotics are generally regarded as safe for women who are worried about scarring. Any type of tetracycline though, including doxycycline, should be avoided during pregnancy. If you’re struggling with acne during your pregnancy, you should consider speaking with a dermatologist about a solution. However, you should speak with your primary health care provider before taking any type of medication or using any type of topical treatment. Even if your dermatologist knows that you are expecting, he or she might not know the full effects of treatment on a developing fetus, and risking your baby’s health and well being for cosmetic improvement isn’t worth it. There are many ways to treat acne whether you are pregnant or not, so don’t lose hope if a few pimples show up. By drinking lots of water, not touching your face with your oily fingers, wearing makeup sparingly, using sunscreen, and reducing stress, you might not even need any acne treatment. Your pregnancy might wreak havoc on many different parts of your body, but your face’s complexion does not have to be one of them. Next: Is B.O. a Breastfeeding Requirement?